(05-20-2014, 03:26 PM)NoobyPoh Wrote: ayos pala to comm. tumawag na ko sa Maketrade ATR. 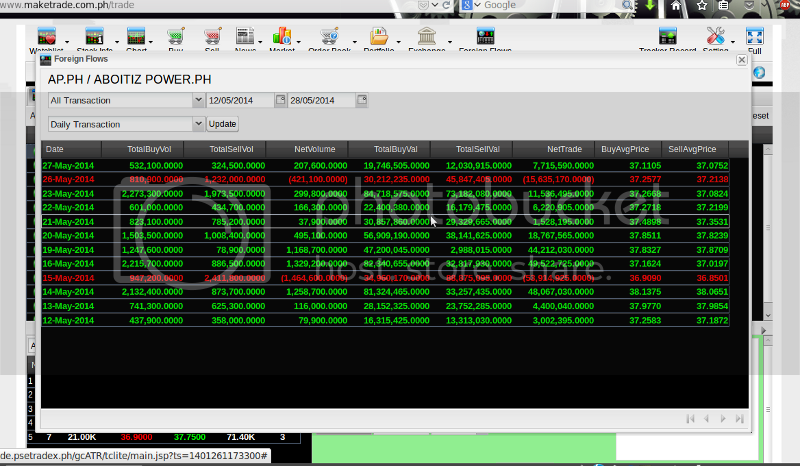 pwede transfer stocks sa COL or other account papunta sa kanila dapat lang itratransfer worth above 25k. sila na bahala magbayad sa charges. up to 5 stocks daw pwede eh. pwede dito lagay mga long term stocks. tapos trade nalang sa COL.
oo nga e. so baliktad? trade sa Make tapos long term kay COL? 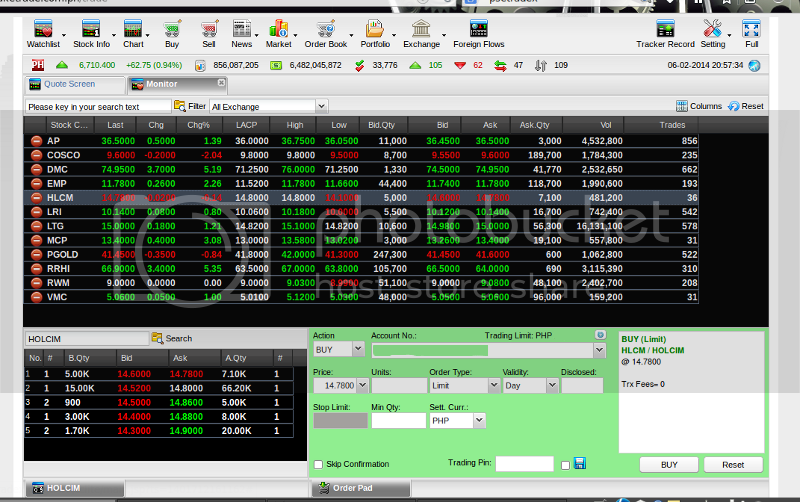 Looking at the screenshots from their webpage, parang PSE Tradex ang interface..
Kumusta naman kaya ang performance? Feedback naman sa meron account dito. Some snapshots, since they don't provide a trial account. They use the PSETradex platform. Other online brokers also use this platform. 3. Customizable watch list. You can also customize the columns to fit your needs. Lower right portion is the buy/ sell pad. Lower left portion is the bid/ ask. 4. 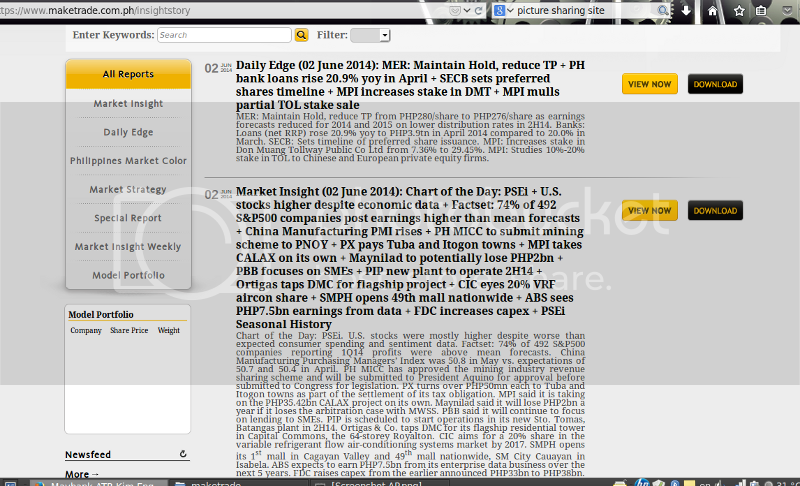 Functionality to view the foreign inflow/ outflow of a particular stock. 5. Realised Gain/ Loss under the portfolio icon. 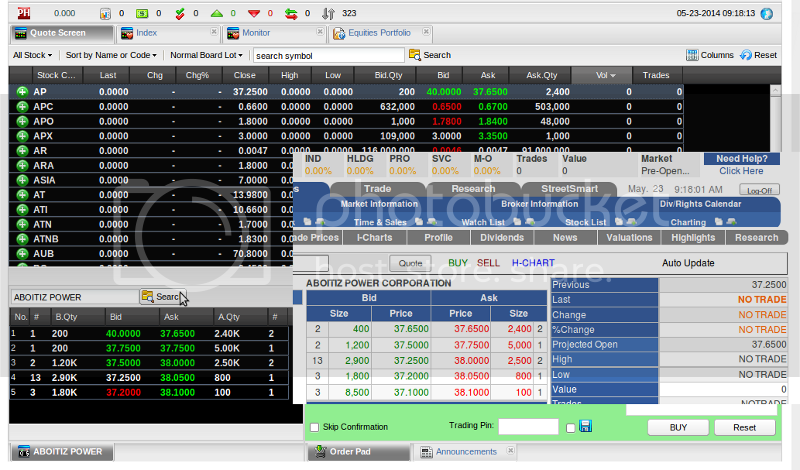 Lists the stocks that you have sold and the accumulated realised gain/ loss of your account. From the image above, the support and resistance levels is automatically plotted by the charting software. It also indicates if a breakout has occurred. * Chartnexus fails sometime. (see photo above) Reloading the chart usually fixes this. * Sometimes the chart is delayed (last price not reflecting on the chart). Again, i usually reload the chart when this happen. * You cannot deactivate the support/ resistance, it is always turned on. Depending on the size of the candlesticks on the chart, this sometimes makes viewing the chart difficult. * The pre open/ pre close can be a bit tricky. You'll notice that the bid price is greater than the ask price. Viewing this on another online broker shows that the 2 bidders are being matched to the lowest ask price. * When you view your portfolio, each individual stocks will be in its gross value. * I find the ticker tape challenging to watch because of its width. Though it's possible to resize the ticker. 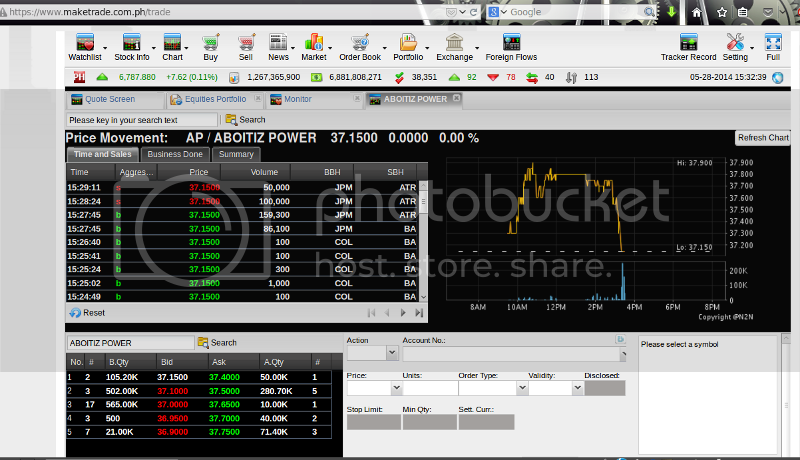 I also noticed that it's a bit laggy compared with the other online broker I'm using. * Execution of orders can be quick since its possible to disable the trade confirmation pop-up and its also possible to save the trading pin. * Some features available on other online brokers are non-existent since they use a different platform. thanks for posting the snapshots..
is this feature available in the platform? Parang wala, mula na rin dun sa site ng tradex, meron dalawang version, isang Explorer at isang Expert. Yang Explorer para sa retail tapos yung Expert para naman sa mga brokerage. Nabasa ko na rin sa site nila na pwede daw i-customize yung pagkakaayos ng panel pero parang para sa Tradex Expert lang yung nabanggit nila. itanong natin kay senor barbero kung anong version available sa retail accounts..
to those who were asking how much is the initial funding to open the account. it is 25K. 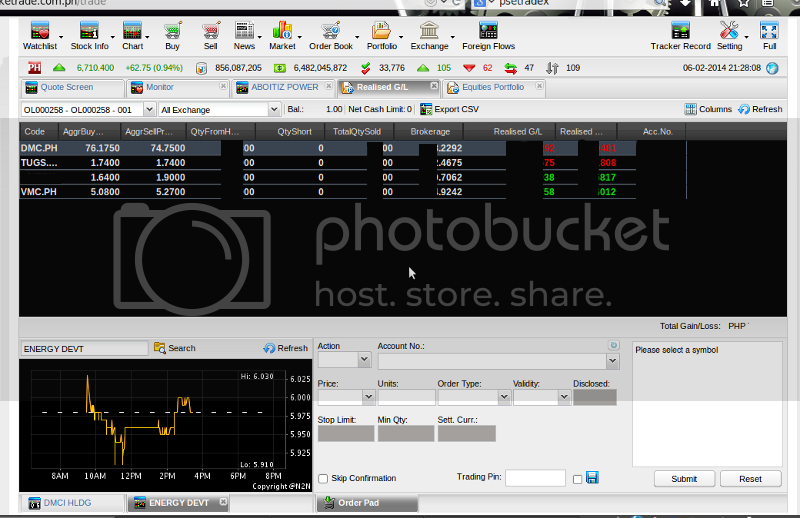 I opened an account with them way back in January 2014. and since then this is the best platform for our local bourse. PSETRADEX is better than Philstocks better than Technistocks (COL,FMS,BPItrade etc..) IMHO. Commander Ollie mag-open ako ng account sa MakeTrade. According to Senior Ramon waived na ung personal appearance para sa mga present sa smp eb last Dec 6. I already filed my application online. Hiningi na ba ni Senior Ramon ung list ng attendees s eb? (12-09-2014, 02:39 PM)back2basic Wrote: Commander Ollie mag-open ako ng account sa MakeTrade. According to Senior Ramon waived na ung personal appearance para sa mga present sa smp eb last Dec 6. I already filed my application online.